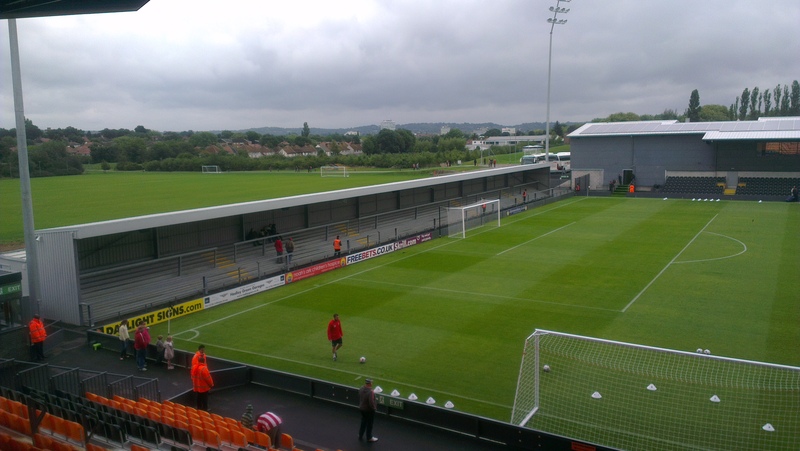 Barnet moved to the Hive in 2013 and it is a far cry from their old Underhill ground, although it still feels somewhat unfinished. 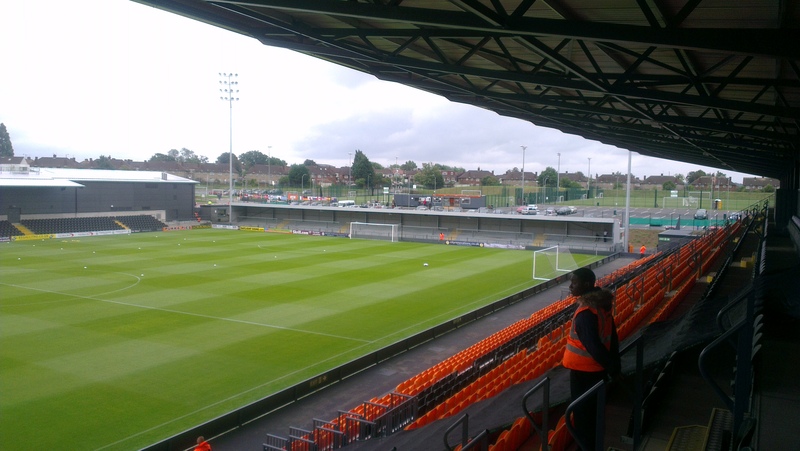 Despite favouring new grounds in my youth, that is certainly not the case now due to the fact that most are unoriginal and that is certainly the case with Barnet's The Hive. Whilst on the face of it, it looks relative unique, it has a design exceedingly similar to Morecambe's Globe Arena. One thing I will give to Barnet though is that I never thought I would be paying £23 to watch a normal league match in the Conference. The ticketing structure at The Hive is beyond ludicrus and not only due to the pricing structure. If you don't pre-order concessions then you can't get them on the day, not that I have to worry about that. You could also book your tickets in advance as well using a mapping system to book your specific seat. Whilst in that sense I like the organisation and the fact that no-one can come up to you saying that you are sat in their seat when you're not, if is very bizarre to see this type of ticketing structure outside of the Championship, and even then it isn't common. Anyway, travelling down to London is relatively simple. I'm not going to lie, I absolutely hate our capital city, I really cant't stand it and believe me, I try to avoid it as much as is humanly possible, but the only positive I will give it is that it is exceptionally easy to get to the capital and it's transport system is fantastic. It is quite easy to get to the ground on the Underground and once you get off, the ground is only a five/ten minute walk away. Specially around the ground there isn't a lot to do, but if you're not wearing colours then you can easily get into their impressive bar. This bar has luxery seating, numerous places to watch whatever match is on the TV and the time. However, despite Barnet advertising as open to all fans before the game, no Lincoln fans were allowed in and the only reason I got in was because of the lack of colours and that there were no security on the door at the time. The club shop is also right next to the ground but offers very little in terms of actual items to look at other than replica kits. Next to the ground is the famous "Hive Development Centre".....or as should be known, three football pitches placed right next to each other. There were several games of various youth levels going on before the match, so I stood and watched one of them....I suppose it's better than sitting outside of the turnstile. The turnstile system is also strange because, although they let you through the turnstile from 1pm onwards, you get through and you're met by a large gated area and they don't let you in the actual ground until 2pm.....effectively they have caged you in for an hour and charged you over £20 for the pleasure. Fortunately the staff were friendly enough and I got into conversations with a few of them, although I certainly wouldn't use the word "knowledgable" when it comes to football. For this game I sat in the main stand, a large temporary seated effort on the side of the pitch. 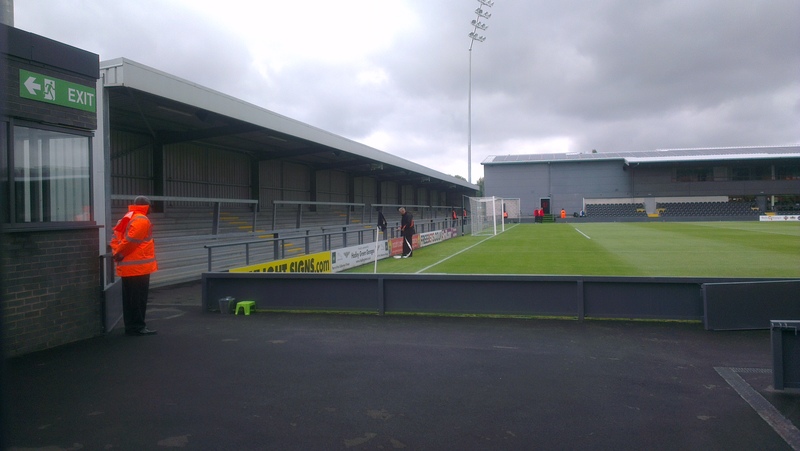 It is of a decent height and the away fans get a decent sized section of the stand. The view from this stand is excellent and although the potential for being antagonised by the home support is still there, they are a decent distance away. There were pretty much no facilities at all in this stand, although there was a bar that didn't feel finished as there was just a concrete floor, no carpet, no tiles, no laminates, nothing. The stand opposite is a strange effort as the seated second is tiny, but the stand itself is huge. Obviously the Hive was never designed to have an actual football ground at it, so this would explain this as it's wall at the back is also part of the bar mentioned earlier. Whilst not an awful stand, it is certainly out of place. Between either goal are, what at least appears to be, identical terraces. Without having gone in the away one I can't comment fully on it's quality, however, it did appear to be of a semi-decent size and the atmosphere that could be generated in there was fantastic. Speaking of atmosphere, much like at Underhill, Barnet don't really have one. They sat quietly throughout the game and only really got loud in the five minutes or so after they scored. Infact, the Barnet fans were exceptionally quick to get on their team's back when things weren't going as perfectly as they would have hoped. Whilst they didn't antagonise the Lincoln fans, I can imagine that in a derby situation then these fans would get extremely hostile. I'm not going to lie, I'm not a fan of the Hive, it's not particularly nice and other than the ticketing system, offers nothing unique. 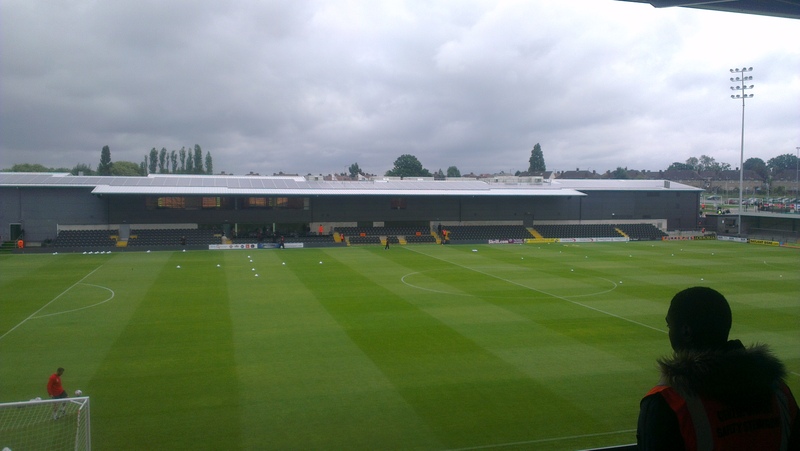 There is pretty much no chance that I would ever come to the ground if Lincoln aren't playing there, and I severely hope that when we move ground in a few seasons, it is nothing like the Hive. Just because it has a half reasonable score (by my usual standards below) I guarantee you that I don't like this.